When you stay at Qunci Villas in Senggigi, you'll be on the beach and within the vicinity of Bangsal Harbor. This 4-star villa is within the region of Karang Divers and Gili Trawangan Night Market. Make yourself at home in one of the 78 air-conditioned rooms featuring minibars. Rooms have private balconies or patios. Complimentary wireless Internet access is available to keep you connected. Partially open bathrooms with showers feature rainfall showerheads and designer toiletries. Pamper yourself with a visit to the spa, which offers massages, body treatments, and facials. You're sure to appreciate the recreational amenities, which include 3 outdoor swimming pools and bicycles to rent. Additional amenities at this villa include complimentary wireless Internet access, babysitting/childcare (surcharge), and gift shops/newsstands. Grab a bite at one of the villa's 2 restaurants, or stay in and take advantage of room service (during limited hours). Quench your thirst with your favorite drink at a bar/lounge. 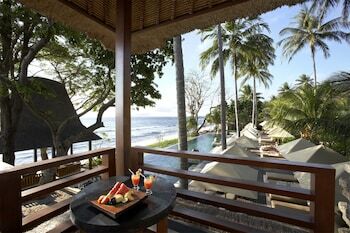 Qunci Villas is an ideal Senggigi lodging choice for your trip to Indonesia. With numerous amenities for guests such as 24 hour front desk, gift shop, jacuzzi or spa, you will wake up at Qunci Villas feeling refreshed every day for your time in Senggigi. Don’t let this amazing reservation opportunity pass you by, book your stay at Qunci Villas today to make the most of your time in Senggigi, Indonesia.